In this weeks issue of Science Magazine there is an article on “Origins and Genetic Legacy of Neolithic Farmers and Hunter-Gatherers in Europe”. Based on DNA evidence it shows that agriculture in Europe has not spread from human to human via word of mouth but rather been introduced across the continent by people moving from its point of origin in the Middle East 11000 years ago to Northern Europe where it was introduced about 6000 years ago. The farmers lived side by side with the hunter-gatherers for thousands of years before an assimilation took place and the two ways of life and peoples became one. But still today you find more hunter-gatherer genes the further North in Europe you go and more farmer genes in the South. 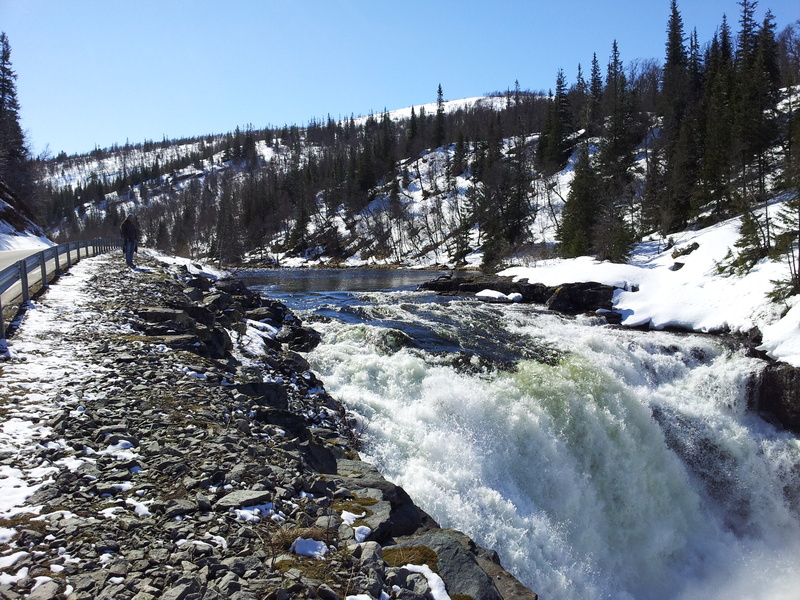 Incidentally we are now walking through an area with both “Norwegian” and Sami population. We have a Sami village on either side of us as I am writing from Kirkvollen, Tydal, Norway. We are still living in a time and place where these different styles of life run parallel! But we don’t have to be Sami in order to have a whiff of a nomadic lifestyle or the hunter-gatherer genes here in the North. I myself am deeply influenced, marked by – and grateful for – a childhood where I experienced the Nordic “fäbod-culture” first-hand. This was a system where the farmers walked with their cattle up into the mountains in the summers to graze. And back again to their homesteads in the valleys in the fall. It is easy to see a link here: Our forefathers the hunter-gatherers followed the wild reindeer and the aurochs in their yearly treks from forest to mountain, the Sami people are following the half-domesticated reindeer and the “fäbod”-users were following their domesticated cow, but in all three instances it is about following the animals in their yearly migrations between summer-pastures in the mountains and winter pastures in lower-lying areas. We, the people of the Nordic countries are still in many ways expressing these patterns in our daily lives. 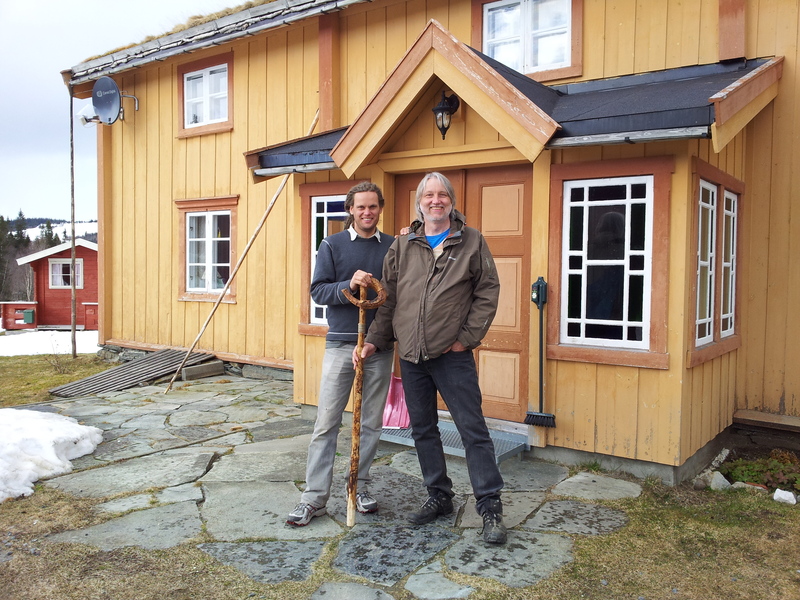 When we have been out on our walk here in Norway we have often lived in “surplus” houses in the ancient homesteads. Many farms here in the countryside have two houses in their yard, one often traditionally inhabited by the grandparents but they have also been used, and still are in some places, as a summer-house you move to across the yard in the spring and back to the main house again in the fall. A last remnant of the hunter-gatherer? The Norwegian’s relationship to his “hytte” (hut) and the Swede to his “sommar-stuga” (summer-house) is more than just “vacational” – it is deeply ”existential” and an expression of a collective unconscious. And our ”allemansrätt” – ”the right of everyman” is deeply inbedded in us, not primarliy as a law in our lawbooks, but as a code of conduct and a way of relating to the great wilds that surround us and still in many ways sustain us. The ”allemans-rätt”, the freedom to roam, is an ancient practice that grants great access to uncultivated land in the countryside but also based on the respect of it and all visitors are expected to show consideration for farmers and landowners, other users and the environment. These ancient traditions are nothing but national treasures that need to be maintained and proudly transferred to new generations of dwellers here in the North. When the great ice sheet in this part of the world started to melt around 10 000 years ago the animals quickly inhabited the virgin pastures and the hunter-gatherers followed in their tracks. Long thereafter the farmers immigrated and laid the base for a way of life that has been the main source of living in our countries up till the present time. The meeting with the already established hunter-gatherers probably wasn’t always without conflict, but proved very fruitful in the end and still run as a cross-pollinating trait in our culture. Today new generations are immigrating to our shores and as the hunter-gatherers and farmers before them they are seeking greener pastures. In our meeting with them something new is born, something more viable and nourishing, beautiful and true. It does not come without conflict but out of the conflict something we all can feel part of and proud of is created in the end. The meeting with “them” becomes a meeting with “us”. Let me end by sharing a song; it is an old “Buffärds-march”, “buffärd” being the local Malung-word for the trek with the cattle in the spring up into the mountains. I have given it new words and a new arrangement but you can easily claim it is a song with ancient roots. This is a track with traces of daring hunters walking into virgin wetlands where the ice has just let go of its primordial hold.